This time last week the Millers were getting ready for their second game in Austria when a Michael Smith strike was the only goal of the game. The Millers also won both mid-week games, both on Tuesday evening, against Sheffield FC and Stocksbridge Park Steels, when a number of players got minutes on the pitch. Paul Warne also added to the squad this week giving a two year contract to former Sunderland defender Billy Jones while young striker Jerry Yates left for a years loan at Brunton Park with Carlisle United. Yesterday Rotherham entertained Grimsby Town in a behind closed doors game which saw a Michael Smith double and a Jon Taylor goal in the three-one win. Apart from the win some more good news from the game was that Jamie Proctor, who was injured in just his sixth game for last August, got some game time. 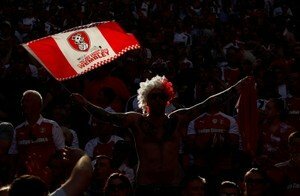 It has been rumoured that Paul Warne is still hoping to get Richie Towell back to the New York Stadium, whether it be on loan or a permanent deal hasn’t been mentioned. A problem with this is that Brighton and Hove Albion being in the Premier League are ruled by the ‘home grown rule’ which says ‘a maximum of twenty-five players in their first team squad and eight of those have to be home grown (which in layman terms means – a player must have been on the books of a club affiliated with the Football Association for at least three years before they turn twenty-one, which doesn’t necessarily mean they have to be English. At the moment I believe Towell is included in the Seagulls twenty-five. And, of course, we are still waiting for a goalkeeper – we are still hoping it will be Marek Rodak but if not I imagine – hope – Warney has other ‘keepers on his radar. This coming week we entertain former Manager Neil Warnock’s Cardiff City at the New York Stadium. This is on Wednesday, 25th July when it will be a 7.45pm kick-off. Tickets are now on sale – Adult £13, Concessions £8, U17’s £1 if bought in advance.